I’m a huge sucker for chicken pot pie. It’s one of my all time favorite foods. And since pie irons make every food taste better – why wouldn’t I come up with a chicken pot pie recipe for the pie iron? 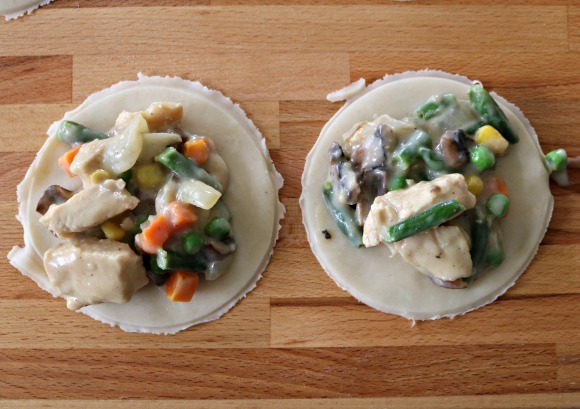 While making these mini chicken pot pies is a bit more work than making one big pie – they are seriously delicious! And you could use this recipe not only for camping, but also a great make ahead packable lunch. I just got new round pie irons so this was the first time cooking in them. My first step was to season them and now that I’ve done that step a time or two, the process went a lot smoother. Look at that gorgeous black finish! I adapted this recipe from a freezer cooking book I’ve had for years and years called Don’t Panic – Dinner’s in the Freezer by Susie Martinez, Vanda Howell, & Bonnie Garcia. It’s an awesome book! 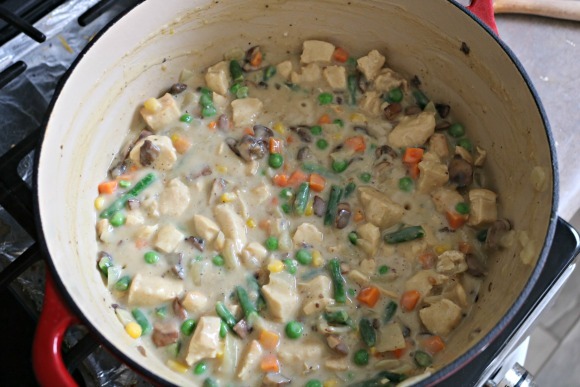 And this is my ALL TIME FAVORITE chicken pot pie recipe. It’s easy, quick, and so tasty. My point here is that the quantity that the list below makes is enough to cut in half and use for both a regular pot pie at home and 6-8 pie iron chicken pot pies. As you might guess – the remainder of the filling below can be frozen and used another time. Or you could just cut the quantities below in half. The recipe below is not exactly what you’ll find in the book, but similar with variations based on my family’s preferences. The nice thing about this recipe is that you can do nearly all the prep at home – in fact you should do all the prep at home. Trying to make the filling and dealing with rolling out dough would be very difficult and time-consuming at a campsite. Plus if you follow the recipe above – you’ll have a LOT of filling so you’ll be all set for another weeknight dinner. The very first thing you need to do is cook your chicken and cube or dice it. I normally like my chicken in slightly larger pieces, but because these finished pies are fairly small it’s probably wiser to cut your chicken up smaller. Get those frozen veggies out of the bag and simply warm them. It doesn’t matter if you do it over the stovetop or in a bowl in the microwave. You just want them defrosted so they don’t cool the filling when you add them to the mix. 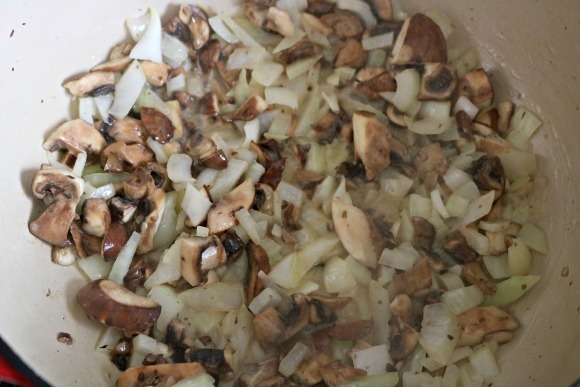 Chop your mushrooms and onions into fairly small pieces. Melt the ¼ Cup of butter in a large pot over medium heat. 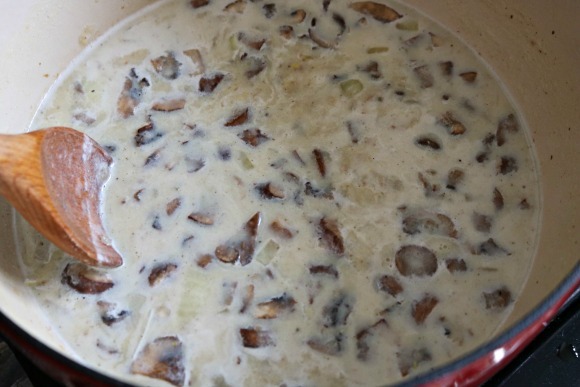 Once the butter is melted – add your chopped onions and mushrooms. Cook, stirring frequently, until your onions are translucent but not brown. Add the salt, pepper, sage, and flour to the pan. 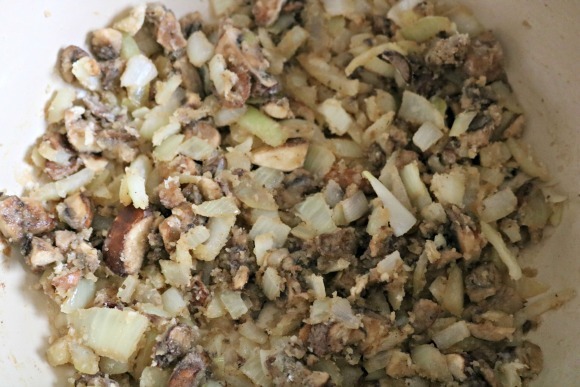 Stir it all together until the flour forms a sort of crumbly brown topping to the onions and mushrooms. 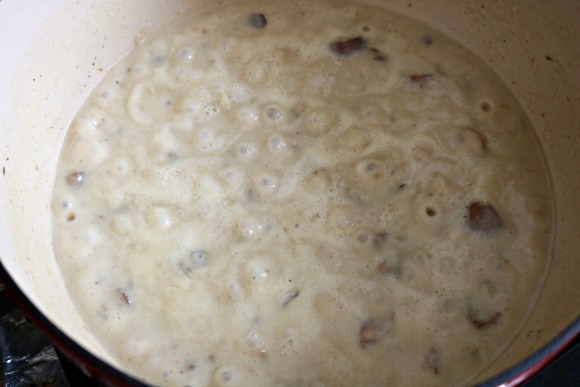 Next, stir in your milk, water, and bouillon paste or granules all at once. Mix together thoroughly. Cook over medium heat until the sauce thickens and you see bubbles. Then cook for 1-2 minutes more. It should look like the picture below. 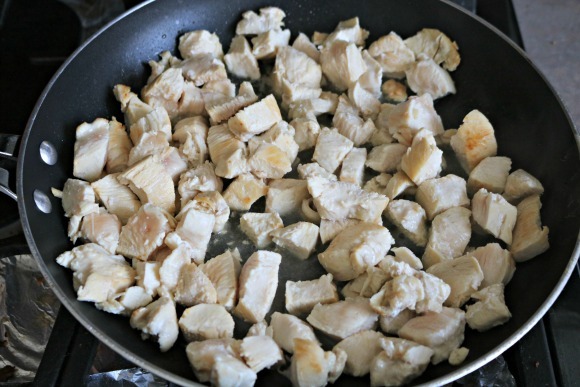 The last step in the filling is to simply add the cooked chicken and the veggies to the mixture and stir to combine. I usually let it warm up a little bit so the flavors meld together. How delicious does this look? Once your filling is at this stage, take it off the heat and let cool. Once it’s cooled (if it’s not cool enough you’ll melt the bag), split it into two halves and put both halves in separate ziptop plastic bags. Each bag will make 6-8 pies so if you’ll only use one bag’s worth on your camping trip – freeze the other bag. This was really the step that took a little trial and error on my part. Pie crust does not behave the same way as pizza dough or bread in the pie irons so I had to experiment to get that gorgeous little pocket I was after. 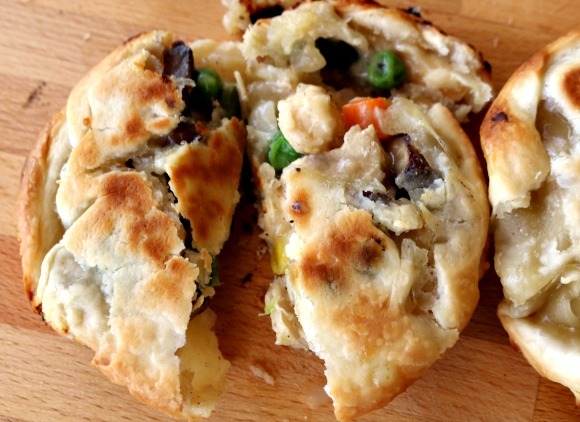 I initially thought to make these little pies like you make a regular pot pie. You have 2 identical circles of dough slightly bigger than you need. I cut these out using a large cup we had. It seemed like a great idea, but after a small failure (see the At the Campsite section for more explanation) I realized that you need one crust smaller and one crust slightly larger. I hate waste so in order to reuse all that crust in between the circles – you have to re-roll it out and cut it again and again. And trying to roll out crusts at a campsite is just not fun. So the next time we bring these camping (and we will!) 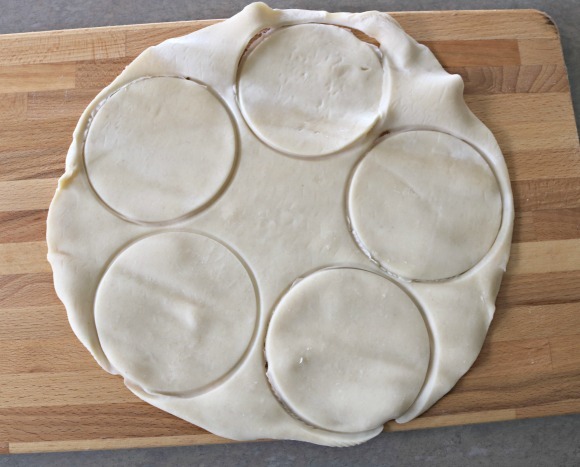 I’ll cut the circles out at home and layer them between wax paper. When I’ve got all the smaller and larger pieces cut out – I’ll put them in a ziptop plastic bag to bring with to the campsite. No fuss campfire cooking! All you really need to do is assemble your pies and cook them! You did all the hard work at home. First thing you need to do is get your fire going. 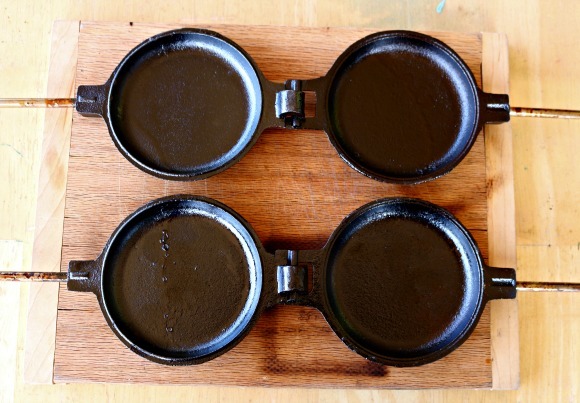 You’ll want red hot coals or white hot briquettes to cook on. When your fire is going – feel free to place the pie irons in the fire to start warming. I initially went about making these pies the same way I do pot pies in a regular pie pan. You start with one circle of dough. Next, you put the filling in the middle and put the second crust on top. And finally, you pinch the edges shut all around to keep the filling inside. Turns out – that doesn’t work quite as well in the pie irons. I heated my pie irons up in the fire like I normally do. 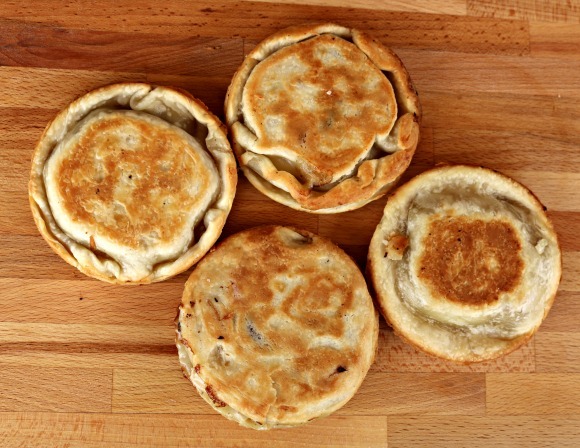 While they were heating up, I created two mini pies using the steps I just mentioned. 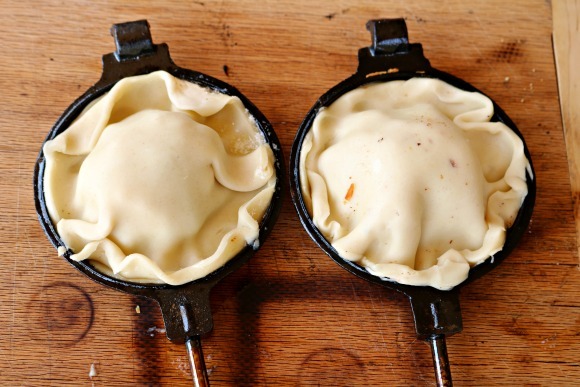 But when I went to lift the pies into the hot pie irons, the pies virtually fell apart. On one of them, I took some leftover crust and tried to add a second layer all around the edges. It’s ugly, but it kept the filling inside. What a mess huh? But I went ahead and cooked them thinking they would probably still taste fine. And then I burned them! Doh! But they still tasted fine! Lesson learned – my coals were too hot. For the next go-round, I opted to create one small circle and one larger circle. Heat your pie irons, butter them lightly, then place the smaller circle in the pie iron. Add a small scoop of filling, and place the larger circle on top (leaving the mound of filling in the middle). Then carefully push the edges down around the mound. It’ll look like the picture below. This method worked phenomenally. I cooked each side for about 10 minutes. I didn’t put them directly in the hottest part of the coals because that created the burned ones above. Check for doneness at the 20 minute mark. If both sides aren’t nice and brown (like a regular old pie), then cook each side for about 2 minutes more. Check again. Your pies should look like this when they’re perfectly done. 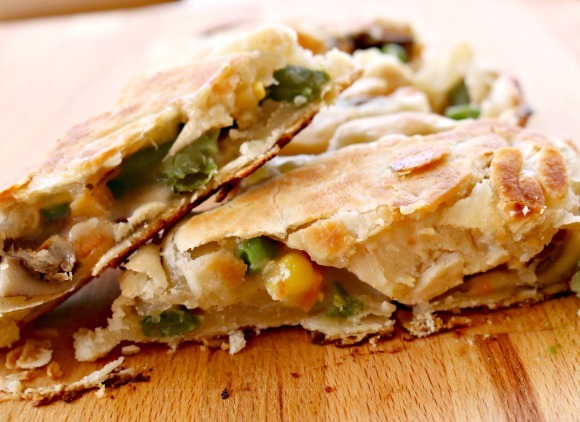 My kids raved about how much better these were than regular pot pie because there is more crust – and that is their favorite part! I do it a different way. I take a small pot pie from the freezer section of the grocery store, and thaw it out. Then I place it in a Pie Iron and bake it in the pie iron. 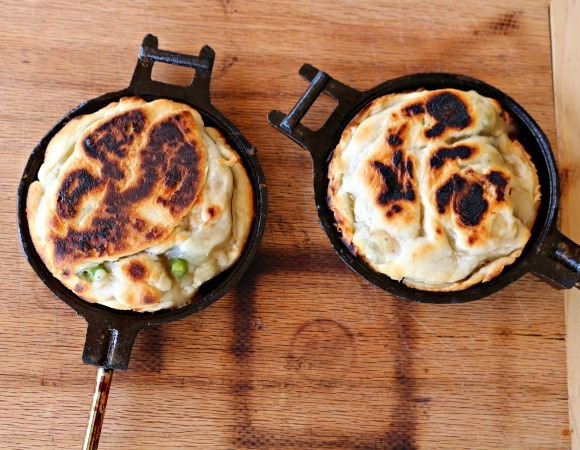 I use the frozen pot pies that have a crust for the bottom and top, however. One can make a crust if you have a frozen pie with out the crust on the bottom. 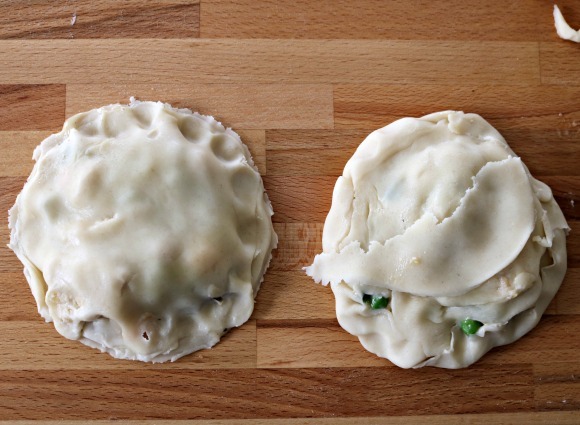 However you cook it do it with a Pie Iron for about 10 minutes, each side, for a thawed small frozen pot pie.